The 2016 presidential election cycle is only a few months old, and already, many prospective voters are looking for a way out. Stuck between a big-talking businessman who has a tendency to spout particularly offensive things, and a former Secretary of State who just keeps getting mired in political controversy, it sometimes seems as though the voters just can't catch a break before they're inundated with another round of partisan savagery. Fortunately, Late Show host Stephen Colbert had his own brilliant candidate suggestion after a taping of Wednesday night's episode: Late Show guest and SpaceX CEO Elon Musk, whose presidency would no doubt shake things up for the better. During Wednesday's Late Show visit, Musk was as absorbing as ever, hinting that his SpaceX aeronautics company would be able to build a perfect its transport rocket for manned use within the next two years and joking about how the rocket's previous crash tests had broken his heart. Ever the eccentric inventor, Musk also explained that colonizing the planet Mars might take some time, as it needed to be first warmed to an acceptable level for human habitation — that is, unless the process were to be "sped along" somehow. And just how did Musk recommend humans accomplish that? "The fast way is to drop thermonuclear weapons over the poles," Musk quipped. "You're a supervillain," joked Colbert in response. "Superman doesn't say, 'let's drop nuclear bombs', that's Lex Luthor, man!" Despite the barb, however, it seemed Colbert was more than happy to cast Musk in a much more serious role — President of the United States. According a report by CNN Money on Wednesday, during the commercial break following Musk's interview, Colbert told audience members that he had been "truly moved" by Musk's comments, humorously suggesting that the entrepreneur should "run for president." 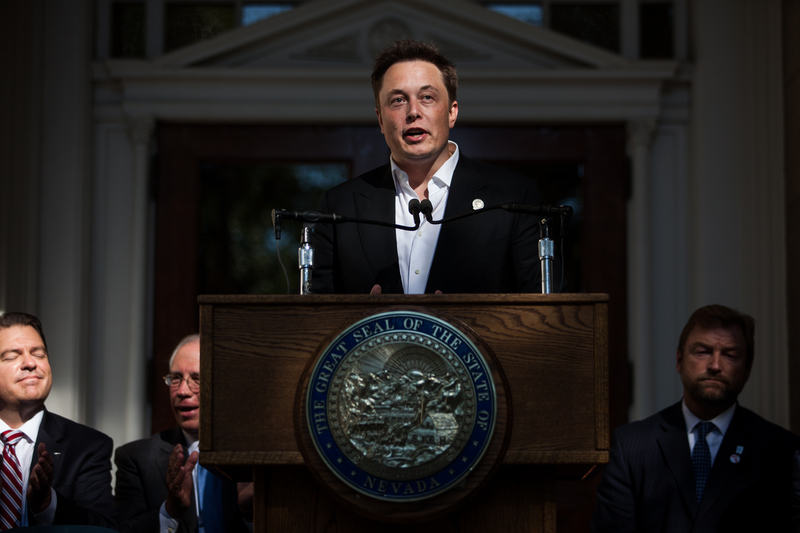 But what would a Musk presidency really look like? Thankfully, if that sort of thing ever did come to fruition, it might actually be a pretty good deal for the American people. Musk, who calls himself half-Republican and half-Democrat ("I'm somewhere in the middle, socially liberal and fiscally conservative," he told an audience during an interview at the University of California San Diego in 2011), could be the type of centrist that actually gets things done, rather than bickering over party lines. And even though his slightly stand-offish behavior might get him into trouble during partisan negotiations, he's still a better bet than, say, Donald Trump (okay, a much better bet). Not only would President Musk be more likely to want to construct compromise, his extensive background in science and engineering might give rise to a more enlightening and progressive four to eight-year tenure. No longer would NASA budgets be needlessly slashed, nor would climate change deniers be able to argue away legislation under the "We're not scientists, but..." gig that they've been playing at for so long. If ever elected president, it's more than likely Musk would make sure NASA and private aerospace companies had adequate (albeit balanced) funding and open opportunities and incentives to compete with one another, while still being able to maintain the budget. As for those climate change deniers? They'd be shaking in their boots the minute President Musk ordered Congress to give up the fossil fuel game and start responsibly channeling acceptable funding back into the renewable industry (Musk famously criticized the prolonged fossil fuel era as "the dumbest experiment in history," during an interview with Wait But Why's Tim Urban in June). Of course, all of this is just conjecture and unlikely to ever come up in real political discussions, but it's an interesting idea nonetheless. And for his part, Musk handled Wednesday night's Late Show interview with enough awkward charm to unintentionally force Colbert to even consider the far-fetched scenario of a Musk presidency in the first place. But let's face it: Even if Musk did manage to garner a vocal supporter base for a presidential run, he probably wouldn't even be here to make use of it anyway — he'd be too busy colonizing Mars.